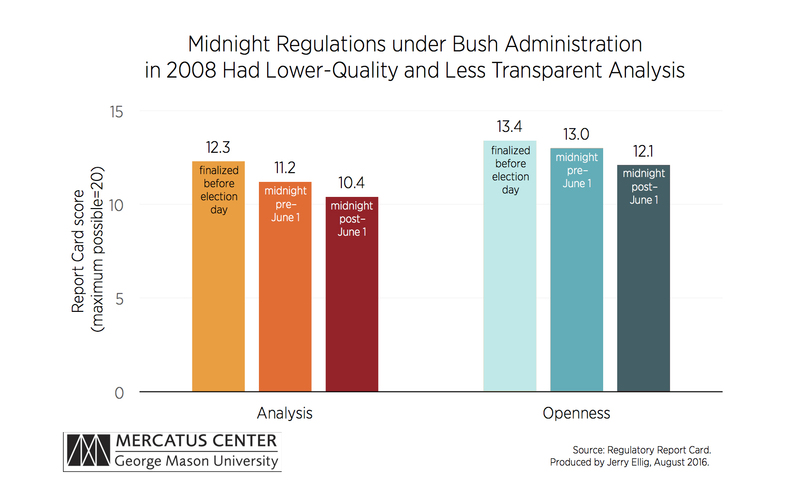 The Mercatus Center’s Regulatory Report Card demonstrates that regulations finalized during the most recent midnight period, at the end of the Bush administration, are accompanied by less thorough and less transparent analysis than other regulations. For more than three decades, a series of presidential executive orders have required federal agencies to conduct a regulatory impact analysis (RIA) to identify the problem they are trying to address, assess its significance, examine a wide range of alternatives to solve the problem, and assess the benefits and costs of the alternatives. The Regulatory Report Card assessed the quality of RIAs for “economically significant” prescriptive regulations proposed from 2008 through 2013. Two major Report Card categories—Analysis and Openness—evaluate how well the agency analyzed the key topics an RIA is supposed to cover and how accessible, understandable, and well-documented the RIA is. 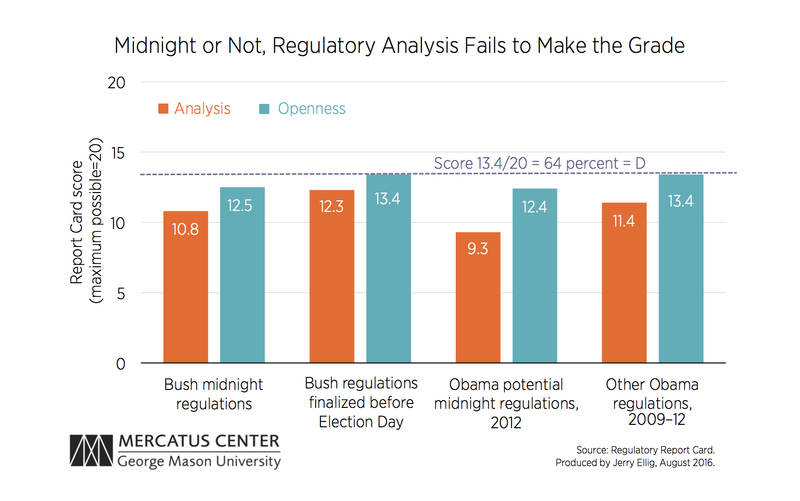 As the chart shows, the Bush administration’s midnight regulations had lower scores both for Analysis and for Openness. Pre–June 1 midnight regulations were proposed before the administration’s self-imposed deadline of June 1 and finalized between Election Day and Inauguration Day. Post–June 1 midnight regulations were proposed after the June 1 deadline and finalized between Election Day and Inauguration Day. 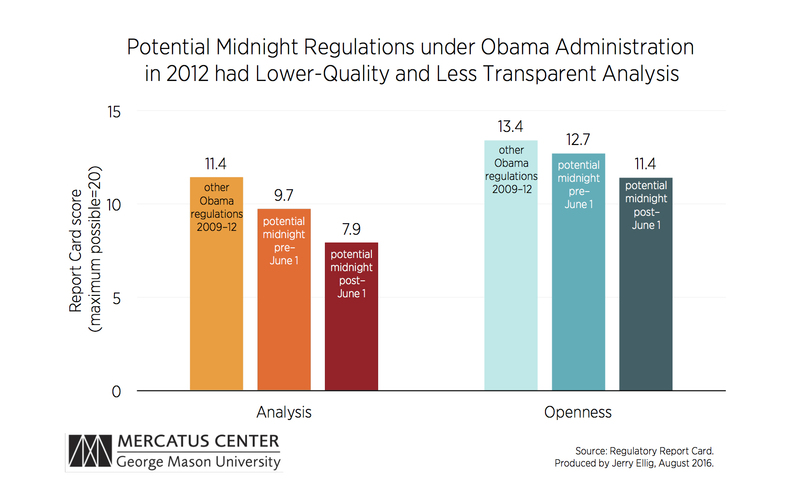 The fact that midnight regulations had less thorough and less transparent analysis, even in an administration that tried to prevent midnight regulations, suggests they are a serious problem. Scholarly research on midnight regulation demonstrates that the midnight effect usually occurs at the end of every presidential term—not just when a president is leaving office. The next chart shows the Obama administration’s regulations that could have been midnight regulations if the election of 2012 had turned out differently. It shows that these regulations have lower scores both for Analysis and for Openness. The problems with midnight regulation—less thorough and less transparent analysis—plague administrations of both parties. Midnight regulations are a problem, but the overall poor quality of regulatory analysis is the elephant in the room. Midnight Regulation: Decisions in the Dark?